The Safety Centre can supply a selection of Emergency Lighting Battery Packs for use with emergency light fittings. 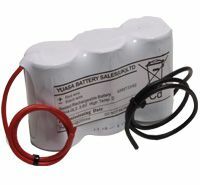 These battery assemblies are manufactured by Yuasa who are a company with a reputation for manufacturing high quality, high performance battery cells. 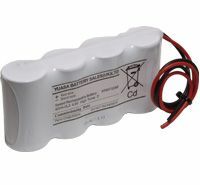 These cells are available as either single cells or in both inline stick or side by side battery assembly orientations. For more information on Emergency Lighting Battery Packs call us NOW on 01200 428 410. 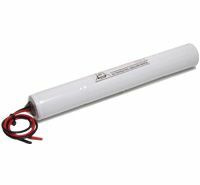 Our E/Lighting Battery Assemblies come supplied with leads and come shrink wrapped into their configuration of either Inline Sticks or Side By Side pack orientations. We can supply inline stick assemblies using D sized 1.2V 4Ah NiCad cells as either a single cell with solder tags or in sticks with 2, 3, 4, 5 or 6 cells in length. The type of pack to be used should be matched to the type of pack already installed in the light fitting. Side by Side assemblies are when the cells are positioned next to each other, rather than in a stick configurations. Again these batteries come in a variety of sizes using the D sized cells. These arrangements are available with 2, 3 and 4 cells laid out in a side by side configuration. Again our cells come with leads already attached for ease of installation. The connectors to be used with our emergency light batteries should be bought seperately and should be matched to the type of fitting in which they are to be installed. The packs come with leads already connected ready for soldering the new connectors onto. If you’re interested in these products you may also be interested in our Briton 996 and Yuasa Batteries ranges.